ItemBARK_1990.0003.0479 - Mr. Chew Lai Keen with Mrs. Lui Mun Ho Keen and their daughter Beatrice; circa 1920. Item BARK_1990.0003.0479 - Mr. Chew Lai Keen with Mrs. Lui Mun Ho Keen and their daughter Beatrice; circa 1920. A family portrait in front of a house. See also P 1599, P 1600, P 1920, P 2054, P 2055, P2056. 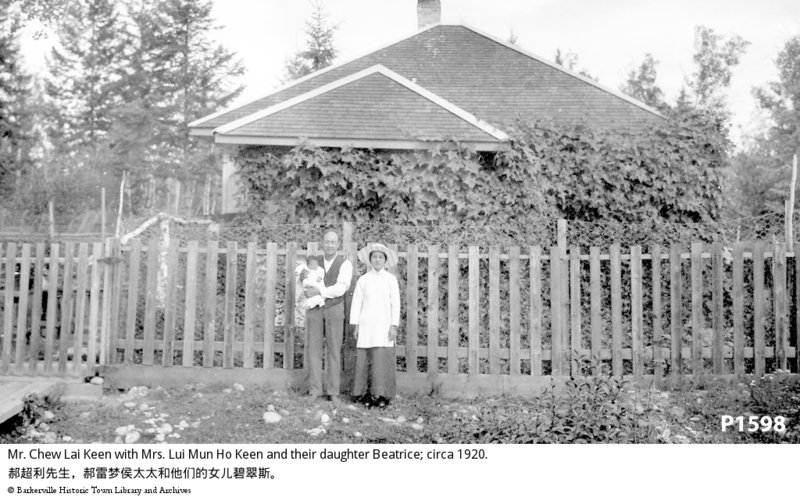 Mr. Chew Keen and his wife and their first born, Beatrice, standing outside a fence yard, for a portrait. Mr. Keen is holding the baby and the woman is standing to his left side. Inside the fence is a garden area with a section of vertical chicken wire stretching across the yard supporting many tall, slender plants. Behind that is another section of even taller plants which obscures the view of a 2 pitched roof building. All that is visible of the building is from the eves of the roof up to the top of the brick chimney. The background has tall, deciduous trees scattered in it.